A bit of a shorter write up tonight, apologies to Fielding Estates in advance but a busy Saturday and prep for a week away has eaten into my time to blog. Fielding followed Angels Gate on the 6th day and it was also not the first visit to this vineyard. Fielding is nestled into Beamsville Bench, neighbour to both Angels Gate and Hidden Bench. Over the years we have had many Fielding experiences and all of them have led us back to the Bordeaux varietals and blends that Fielding seems to do best. As recently as two months ago we polished off a 2004 Meritage that was ready to drink and still had a great deal in the bottle to offer the average drinker, which is shocking for the weak 2004 reds from Niagara. As we have discussed price recently, it is important to note that Fielding is now in the top 5 for the highest prices for Niagara wines. Their high end reds consistently are near the top in price. While this may not matter to many of our readers, for some $60 for a bottle of red is a great deal of money. To put into consideration, Trius Grand Red and Château des Charmes Equuelus are considered cheap compared, and while the tasting is to follow, I am not personally sure the Fielding price properly reflects their quality versus their rivals. Anyways, so much for a short post, let’s move onto the tasting. Knowing the wine from the tasting, we decanted this for a solid 45 minutes to allow it to open and soften as the bold 2007 year rears its head with this offering. A deep red, almost purple accompanies this wine and the nose is solid with red and purple fruits with hints of coffee. The first few sips shows you how heavy and solid this wine is. Having won a gold medal at the 2009 Canadian Wine Awards you have to wonder how or why, not quality wise, but simply this is a big wine and two years ago it would have been harsher. Good strong tannins with a long finish follow up my comments above and really drive home the thought that this wine has a solid 5 to 7 years to settle. It is a big wine. Despite the heaviness, the fruit and subtle hints are here and you will see caramel, coffee and spice complimenting the plum and dark cherry. This is a very good wine and if you have the wallet to purchase a few I highly recommend this as a great Niagara red. The CWG Subjective Rating is 89 out of 100 with points deducted for the elevated price compared to its peers. 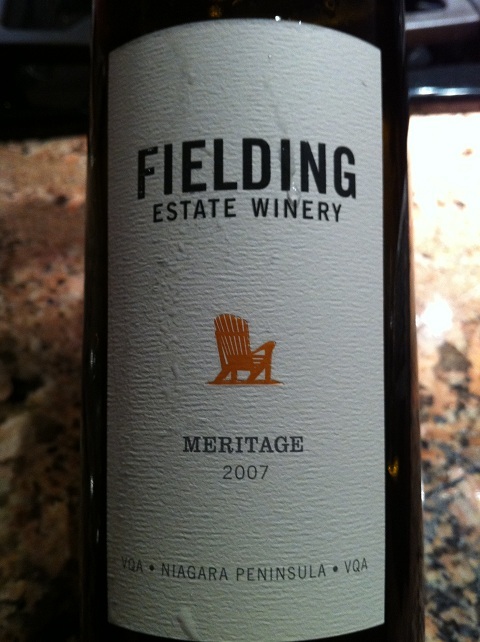 This entry was posted in Canadian, Wine and tagged canadian wine guy, Fielding Estate, wine review. Bookmark the permalink.